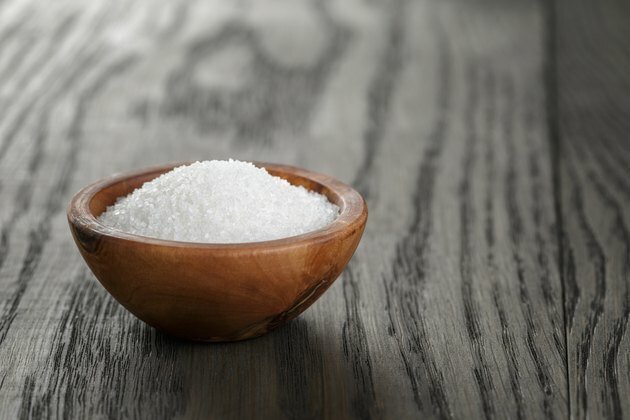 Natural sugar refers to sugars that occur naturally in foods, such as fruits, while refined sugar is crystallized sugar that has gone through processing. While it seems as if natural sugar should be healthier, that's not always the case. Watch your sugar intake even if it comes from natural sources. Sugars are a type of carbohydrate, and each gram offers 4 calories of energy. Carbohydrates provide fuel for your body's processes, including your brain and nervous system. Carbohydrates are broken down into glucose, or blood sugar, by your body. Simple carbohydrates are very quickly broken down by your body and create spikes in your blood sugar, unlike complex carbohydrates, which take longer to process. MedlinePlus states that people should receive between 40 to 60 percent of their daily calories from carbohydrates, ideally from complex carbohydrates and some natural sugars. Refined sugars, on the other hand, lack additional nutrients and are merely a calorie source. Refined sugar refers to sugars that have undergone an extraction and purification process, often turning the finished sugars into crystals that are easy to add to foods. Refined sugar typically refers to table sugar, which is most commonly made from sugar cane and sugar beets. During the refining process, the sugars are processed to the point where the nutrients naturally available in the raw foods -- cane and beets -- are lost. Refined sugar is used as an added sugar in prepared and processed foods, as well as for eating and cooking. Natural sugars are those found naturally in foods. For example, lactose is a natural milk sugar and fructose is a sugar found in fruits. They can also be sugars that are naturally produced, not refined, and are added to foods, such as honey, stevia, agave nectar and maple syrup. Sources of natural sugar are considered healthier than refined sugars, because they usually contain additional nutrients -- for example, calcium from dairy products. However, natural sugars can still count as added sugar -- for example, sweetening your tea with honey or putting maple syrup on pancakes -- and should be limited. The American Heart Association recommends that added sugar, either in the form of refined sugar or natural sweeteners, make up no more than half of your recommended daily discretionary calorie allowance. This equals 100 calories per day for women and 150 calories per day for men, roughly 6 and 9 teaspoons, respectively. Regularly exceeding your daily added sugar limit can contribute to obesity and other chronic diseases, and takes up space in your diet that should be allocated to more nutrient-rich foods. BecomeHealthyNow.com: What Is Refined Sugar? What Is the Daily Allowance of Sugar on a 2,000-Calorie Diet?